"Ripley, she doesn't have bad dreams because she's a doll. " SpaceX CEO Elon Musk tweeted a picture early this morning of “Ripley,” a dummy the spacetech company plans to send to the International Space Station on board the Crew Dragon space capsule this weekend. 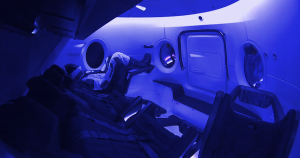 Ripley will be an integral part of Demo-1, the first uncrewed test flight of SpaceX’s futuristic passenger craft that could one day ferry astronauts to the ISS — and the dummy, which is already strapped into the Dragon capsule, is packed with sensors. “We call it a smarty, and her name is Ripley,” SpaceX vice president of Build and Flight Reliability Hans Koenigsmann said in yesterday’s pre-launch briefing. “We instrumented the crap out of this vehicle; it’s got data, sensors everywhere,” NASA’s Commercial Crew Program manager Kathy Lueders added. Ripley — likely a nod to Sigourney Weaver’s character in the 1979 movie “Alien” — is the spiritual successor to “Starman,” the space company’s dummy that rode a Tesla Roadster into the far reaches of Earth orbit. The Roadster launched on top of the first successfully launched Falcon Heavy rocket last February. The human-sized dummy is covered head to toe in sensors that will tell SpaceX engineers about what the experience travelling to and from the ISS will be like for human astronauts. Ripley is wearing SpaceX’s Commercial Crew space suit with its already iconic black visor and white design that was revealed in August 2017. The Crew Dragon is set to launch on a Falcon 9 rocket in less than 24 hours from Cape Canaveral, and will attempt to autonomously dock with the ISS early Sunday morning. If all goes well, SpaceX’s Crew Dragon could be the first American spacecraft to ferry astronauts to space from U.S. soil since the last Space Shuttle mission in 2011 — and Ripley is getting a first taste of what that’ll feel like.